This is the "Marching Machine." The students needed to communicate and work as a team to be successful In this activity each team needs to get all of it's team members over a wall. After a team member gets over the wall, her or she can not go around to help others get over. Students need to plan well to be successful with this activity. 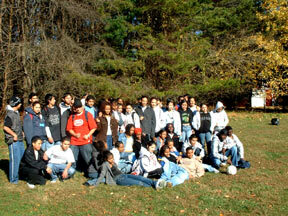 In November, all ESOL 2 students went on a field trip to the Smith Center. It was a lot of fun. We were all exited about it because it was our first time to go on a field trip. The field trip was called the Confidence Course. 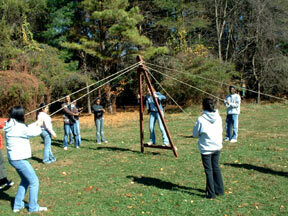 The idea was to learn about adventure, teamwork, and communication. First, the place looked like a huge land surrounded by a forest that has some animals like deer in it. The weather was cold when we got there, but it was a little sunny. We started with activities for the whole group in which we had to form a big circle and play a game called “ I have mail.” Then we were divided into groups, each with its own leader. I was in a group lead by Mr. Shilling, Mrs. Shilling’s husband. Our group started with a game called “Alligator Crossing” in which everybody was supposed to cross from one side to the other side with only four unequal pieces of wood. After this activity, Mr. Shilling said that our group was one of he best teams he had ever seen, because, even though we had some trouble understanding each other, we were working together, encouraging each other. And we were patient in our work until we got the best answer to our question. Then, we passed to another activity called the “Marching Machine” where we all had to be on two long pieces of wood, and we had to walk as one person by moving with the wood on our feet at the same time from a starting point to the end point. It wasn’t that far to walk, but it was difficult because we really needed to communicate with each other at that moment to make things work out. But we did well. Next, we went in the forest where we played some other games like climbing a big wall, flying with a rope, and getting through a giant spider web. We had so much fun. After that, we took a break. And during that break, my friends and I went to the other side of the forest hoping to find some animals and to see what was in that huge forest. We first saw ducks swimming in a small river. They were really beautiful. As we kept walking, we saw ourselves near a house in the middle of the forest, where no one was living, not even animals. We got a little scared because it was just like in a scary movie, and we started running really fast until we got out off the forest. We went straight to tell our teacher, Ms. Tomesek about that little adventure we just had. When the time was up we were ready to came back to school, but first we stood all together and took a lot of pictures. We thanked all our leaders and left with happiness. I can say that we worked a lot in the woods, but after all, we all had so much fun, and everybody wishes to go there one more time. This is the "moon walk. 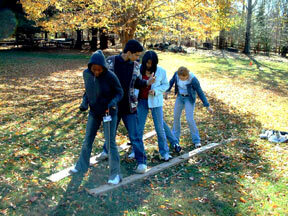 "Team memebrs help the person on the piece of wood to walk a certain distance. The person on the wood needs to give instructions to the people holding the ropes. These are the students in Mrs. Shilling and Ms. Tomesek's classes who went on the confidence course at the Smith Center.